Susan of Emperorp is the blogger of the week. Read all about her and then go visit her blog and say hi! Weetabix with warm milk and brown sugar, toasted wheat bread with butter and marmalade. 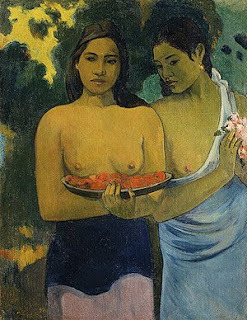 Two Tahitian Women by Paul Gaugin. I love the boldness of the colors and the shy yet confident faces of the women. It became a dream to see the original. Coming from a background where there was not a lot of money this was a huge ambition. I made it to New York to see it at the Met when I was 22. I don't have one, but now I want one and will start hunting!!! My favorite chore is cleaning the kitchen. It's the heart of the home and the hub of all the nurturing I give my family. My least favorite chore is a tie between emptying the dishwasher and putting away laundry, which is surprising because I absolutely love the feeling I get at the end when everything is put away in its place. It's just the process that feels like a drudge...actually trying to make the time for these is probably more the drudge. Soak fruit and sugar in tea and vanilla overnight. Sieve flour and spices into bowl. Melt butter. Lightly beat the eggs and add both to the fruit mixture. Add wet ingredients to dry. Mix well. Turn mixture into a greased and paper lined 8-inch round tin. Bake for approximately 1 hour to 1 ½ hours, checking after 1 hour with toothpick to see if it comes out clean. Continue baking at 5 minute increments until toothpick comes out clean. If necessary, cover with aluminum foil to prevent top from burning. Remove brack from oven and cool on wire rack for 10mins. Remove from tin and allow to cool completely before cutting. You can add 4oz walnuts to recipe, but reduce to 8oz raisins and 8oz sultanas. My tea preference is decaf Earl Gray for soaking tea. I'm going to answer this as a home project that I'm most proud of. Deciding to clear out our garage and turn it from an ugly, disorganized place of storage to an organized and cheerier functional space. Previously it was just felt like a black hole that drained my energy. I dislike having to go in there to do laundry or find something. The challenge was to use only paint and the rearrangement of furniture we already own. I love the garage now. We donated/gave away a lot of stuff and now I can really fee the energy flowing in there. What do you miss the most about growing up in Ireland? I miss being surrounded by Irish voices and accents; the warm, hearty food that my mother cooks; and the beauty of the landscape. What are some of your favorite Irish traditions that you are carrying on with your girls? This is a hard one to answer. There are no specifically Irish traditions that we are carrying on with the girls per se. We teach them that my husband and I are Irish and that they are Irish and American. We teach them that this country has a lot of people whose origins are outside the country and that differences are interesting and wonderful. We have also brought them to Ireland several times and have familiarized them with how beautiful the country looks. Being Irish, we talk about death openly and naturally. We share our culture with them in that they love Irish music and dancing. They love stories of leprechauns and the pooka and the banshee. And I try to create the same sense of routine and comfort I remember from childhood mealtimes. We have some favorite meals always on the same day of the week (they love the predictability of these). I am trying to cultivate the joy of food I loved growing up (and still love): eating potatoes (cooked any way), stew, cabbage, tea bracks, mince pies, boiled eggs with soldiers, Irish sausages and home made, thick cut, chips (french fries). Now that you've read about Susan, go on over and say hi! Very nice of you to feature bloggers! I will go over to her site now as instructed.